You know her as Judy Garland, star of "The Wizard of Oz," "A star is Born" and other classic films as well as the singer of "Somewhere Over the Rainbow," but before she was a legend, she was Frances Gumm, a talented young girl with a big, gown-up sounding voice. Ruby Rakos (Broadway's Billy Elliot) plays Judy (with a younger Frances played by Ella Briggs) in this new musical conceived by Tina Marie Casamento Libby with a book by Marc Acito (Broadway's Allegiance). Judy overshadows her less talented sisters, Virgina (Andrea Laxton and Piper Birney) and Mary Jane (Lucy Horton and Claire Griffin) as the family moves from Minnesota to California to escape the financial ruin (and moral scandals) their father, Frank (Kevin Earley), has created for them. He tries to manage a movie theater while the rest of the family hits the road. His wife, Ethel (Sally Wilfert) eventually begins a relationship with family friend, Bill Gilmore (Jesse Sharp), and Frank hides his homosexual relationship with a film distributor. Judy enrolls in a professional school for child performers where friends Joe Yule (Michael Wartella), Judy Turner (Berklea Going) and Shirley Temple (Lea Mancarella) also go on to fame. (Those first two are Mickey Rooney and Lana Turner, by the way.) This is the story of Judy's childhood and how she eventually gets to step into those ruby shoes -- and fame-- in "The Wizard of Oz." Many song favorites are included in the score (music adapted by David Libby who does arrangements and original orchestrations) like "I'm Forever Chasing Rainbows," Zing! Went the Strings of My Heart" and "You Made Me Love You." Acito weaves them into the story line with skill, so there is no feel of jukebox musical here. The story is quite interesting: I hadn't know most of this background ( Judy Garland historian and author John Fricke serves as Creative Consultant and Historian for the project.) If you are a Judy Garland fan, you'll enjoy this intimate portrait and hearing the songs she made famous. Rakos is up to the task of filling the ruby shoes. She sings well and hits the ending belts required on most of the songs. Her "Over the Rainbow" is moving. Earley and Wilfert find depth and sensitivity in the roles of the parents. Standing out is Karen Mason as Ma Lawlor, the amusing teacher at the school for kid performers and later as Kay Koverman, the assistant to MGM film mogul Louis B. Mayer (Michael McCormick, who excels), who spots something in Judy and is as much behind the girl's becoming a star as anyone. Set Designer Kristen Robinson Ward creates numerous locations with simple changes. The two-hours and 35 minutes could use some trimming. Toning exposition in dialogue in the beginning and consolidating some musical numbers like "Beautiful Girls" would make that possible. Chris Bailey's choreography can be circular and dizzying at times. There's just a lot going on up on that stage at times, though the tap dancing is fun. Those ruby shoes don't look authentic for some reason (Costume Design by Elizabeth Caitlin). I'm not a Shirley Temple expert, but she would have been about 6 when this story is set and Mancarella seems to appear to be more mature than that. 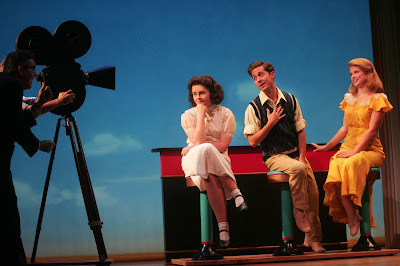 Chasing Rainbows runs at Goodspeed, 6 Main St., East Haddam, through Nov. 27. Performances are Wednesday at 2 and 7:30 pm, Thursday at 7:30 pm (with select performances at 2 pm), Friday at 8 pm, Saturday at 3 and 8 pm, and Sunday at 2 pm (with select performances at 6:30 pm.) Tickets are $29 to $84: at goodspeed.org; 860-873-8668. Lighting Designer: Ken Billington; Sound Designer: Jay Hilton; Music Director: Michael O’Flaherty; Assistant Music Director: Bill Thomas; Orchestrator: Dan DeLange; Creative Consultant/Historian: John Fricke. Thanksgiving Food Drive: Monday, Nov. 21. Buy one ticket, get one free for select seats for the 2 and 7:30 performances with a generous non-perishable food donation to benefit the East Haddam Food Bank. Donations will be collected at The Goodspeed.